The theme for American Archives Month is True Story, which fits well with the life of George Peter Alexander Healy, who was a leading nineteenth- century portrait and historical painter in America and Europe. Born in Boston, he developed an early talent for art and received support from such portraitists as Jane Stuart and Thomas Sully. In 1834, Healy departed for Paris to continue his studies with the French artists Antoine-Jean Gros and Thomas Couture. By the mid-1840s, he established public recognition by exhibiting at the Paris salons, and winning awards and patronage of important American and European leaders. From 1840 to 1848, King Louis-Philippe of France commissioned Healy to create a portrait series of royalty and European and American statesmen for the historical collection at the Château de Versailles. Healy’s portrait series for Versailles was a combination of his original works and copies after earlier masters of more than forty historical figures, such as Elizabeth I, George III, and Charlotte Sophia of England, George Washington, John Adams, Thomas Jefferson, Alexander Hamilton, Benjamin Franklin, John Paul Jones, Horatio Nelson, William Pitt, and Daniel Webster. It was a great opportunity for the artist, who gained permission to copy the original portraits at Windsor Castle under the approval of Queen Victoria. This experience provided Healy an invaluable study of portraits by great masters such as Thomas Gainsborough, Thomas Lawrence, and Joshua Reynolds. He returned to America to portray Andrew Jackson, John Quincy Adams, and Henry Clay from life sittings for this series. At first Jackson resisted, but he was eventually won over by the young artist’s mission. Healy completed this last memorable portrait of Jackson shortly before the former president died in 1845. Although Louis-Philippe was deposed in the 1848 revolution, the French government kept Healy’s portrait series at Versailles as originally planned. On a 1994 visit, I had the privilege of reviewing the Healy portrait collection for the Catalog of American Portraits survey at the Musée National du Château de Versailles. In 1851, Healy completed his most ambitious history painting, entitled Webster Replying to Senator Hayne, which featured130 individuals at the 1830 congressional debate about the constitutional nature of the Union. In 1855, he won a gold medal at the Paris Universal Exposition for his painting Franklin Urging the Claims of the American Colonies before Louis XVI. In 1857, the United States Congress authorized the commissioning of Healy to create a series of presidential portraits for the White House. 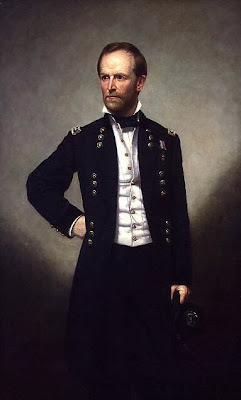 The artist portrayed American statesman and military leaders as well as presidents, including James Madison, John Jay, John Marshall, Martin Van Buren, John Tyler, James Knox Polk, Franklin Pierce, James Buchanan, Abraham Lincoln, Zachary Taylor, Ulysses S. Grant, and William Tecumseh Sherman. Healy was an engaging, talented artist who easily mixed with all levels of society and prominent leaders in America and abroad. Traveling extensively for work, he crossed the Atlantic more than thirty times and lived in London, Paris, Rome, and Chicago. 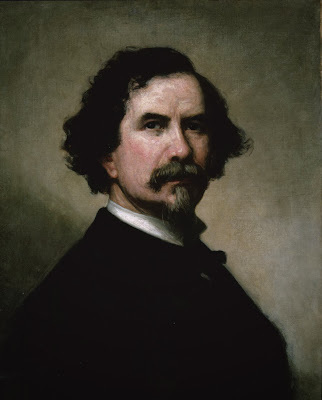 Healy’s success was due to his ability to capture an individual’s likeness and personality. He also experimented with lighting, artistic techniques, and new materials for his paintings. Healy was a prolific artist who created about hundred portraits a year during the height of his career. Unfortunately, many of his artworks were lost in the 1871 Chicago fire. 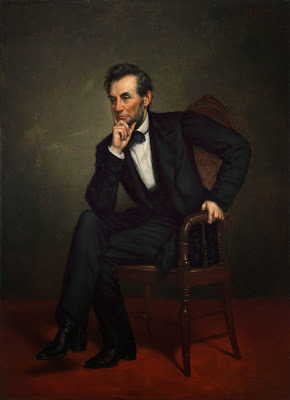 His portraits are currently held in numerous public collections, including the Smithsonian’s National Portrait Gallery, the Corcoran Gallery of Art, and the White House, Washington, D.C.; the Chicago History Museum; the Virginia Historical Society, Richmond; the Museum of Fine Arts, Boston; the Metropolitan Museum of Art and the New York Historical Society; and the Louisiana State Museum, New Orleans. He was the first American artist to be honored by the Uffizi Gallery in Florence to present his own portrait to its celebrated self-portrait collection. Healy’s international influence paved the way for later generations of American artists such as John Singer Sargent and William Merritt Chase, who are also included in the Uffizi’s self-portrait collection. In 1966, the Smithsonian’s National Portrait Gallery founded the Catalog of American Portraits (CAP), a national portrait archive of historically notable subjects and artists from the colonial period to current times. The public is welcome to access the online portrait search program from the museum website of over 100,000 records. The CAP program can be reviewed here. Healy, George P. A. Reminiscences of a Portrait Painter. Chicago: A. C. McClung and Company, 1894. De Mare, Marie. G.P.A. Healy American Artist: An Intimate Chronicle of the Nineteenth Century. New York: David McKay Company, 1954. Fink, Lois Marie. “Healy, George Peter Alexander.” American National Biography Online (February 2000). Voss, Frederick S. Portraits of the Presidents: The National Portrait Gallery. Washington, D.C.: Smithsonian Institution, 2000. Voss, Frederick S. “Webster Replying to Hayne: George Healy and the Economics of History Painting.” American Art 15, no. 3 (Autumn 2001): 34–53.